Just as reasons for owning guns and using them in daily life vary, so do the ways in which gun owners store their guns and the extent to which they see certain measures – such as taking gun safety courses – as essential. 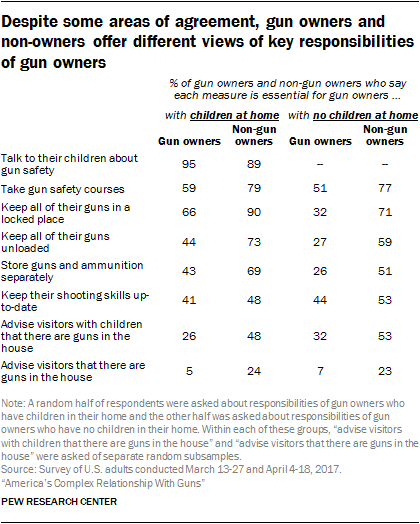 Majorities of gun owners and non-owners alike agree that it’s essential for gun owners who live with children in the home to talk to their children about gun safety, to take gun safety courses, and to keep all of their guns in a locked place. Most non-gun owners also say gun owners with children in the house should keep all of their guns unloaded and store guns and ammunition separately, but this view doesn’t have majority support among those who own guns. When it comes to letting visitors know that there are guns in the home, relatively few gun owners see this as essential. In fact, just about a third (32%) say gun owners with no children at home should let visitors who bring children by know about the presence of guns, and even fewer (7%) say gun owners should advise guests with no children that there are guns in the home. Meanwhile, about half of adults who don’t own guns say gun owners should advise their guests with children about the presence of guns. 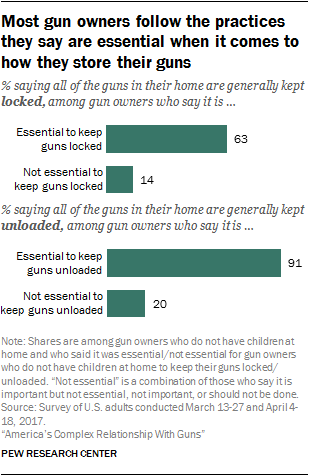 About a third of gun owners (36%) say all of the guns in their own home are generally kept in a locked place, and 44% say all are kept unloaded. Roughly four-in-ten gun owners – including 30% of those with children under 18 at home – say there is a gun that is both loaded and easily accessible to them all of the time when they are at home. As might be expected, most gun owners (75%) say they feel safer with a gun in their household than they would without a gun. Views are more divided among those who don’t own a gun but live in a gun-owning household: About as many say having a gun makes them feel safer than they would feel if there wasn’t a gun in their household (50%) as say they feel no more or less safe with a gun in their household (44%). Among those who neither own a gun nor live with someone who does, slightly more say they would feel safer if they had a gun in their household (28%) than say a gun would make them feel less safe (20%); 52% say they wouldn’t feel more or less safe with a gun in their household. Americans’ opinions of how gun owners should store their guns and ammunition vary significantly when they are asked to consider gun owners who do and do not have children in their home. For example, about eight-in-ten say it’s essential for gun owners with children in their home to keep all of their guns in a locked place (83%); about six-in-ten (58%) say the same about gun owners who don’t have children in their home. And while around six-in-ten or more say it’s essential for gun owners with children at home to keep all of their guns unloaded (65%) and to store their guns and ammunition separately (61%), far smaller shares say it’s essential for those with no children in their home to take these measures (48% and 43%, respectively). Gun owners and non-owners alike are more likely to view each of these measures as essential if there are children in the home. But whether they are asked to consider gun owners with or without children in the home, far higher shares of those who don’t own guns than those who do own them say it’s essential for gun owners to keep all of their guns in a locked place, keep all of their guns unloaded, and store their guns and ammunition separately. In each case, a difference of 24 percentage points or more separates the views of gun owners and non-gun owners, with the widest gap on views of whether it’s essential for gun owners with no children in their home to keep their guns in a locked place – about seven-in-ten of those who do not own guns (71%) say it is, while just 32% of gun owners agree. When asked if gun owners should advise visitors that there are guns in the house, far higher shares say it’s essential for gun owners to do this when they are asked about visitors with children than when the question does not specifically mention children. Roughly half of adults (47%) say it’s essential for gun owners who don’t have children at home to let visitors with children know about the presence of guns; just 17% said it would be essential for gun owners to advise visitors that this is the case when it is not mentioned that the visitors include children. In each case, those who don’t own guns are more likely than those who do own them to say it’s essential to advise visitors that there are guns in the house. Overwhelming majorities of those who do and don’t own guns consider it essential for gun owners with children in their home to talk to their children about gun safety; 95% of gun owners and 89% of non-gun owners say this is essential. Americans don’t distinguish between the essential responsibilities of gun owners with and without children in their home when it comes to taking gun safety courses or keeping shooting skills up-to-date. For example, similar shares say it’s essential for gun owners with children in the home and those with no children in their home to take gun safety courses (73% and 68%, respectively). And about half say it’s essential for gun owners to keep their shooting skills up-to-date, whether they do or don’t have children in their home (46% and 50%). Those who do not own guns are about one and a half times more likely than those who own guns to say it’s essential for gun owners to take gun safety courses. About three-quarters of non-gun owners (77%) say this is essential for gun owners with no children in their home; 51% of gun owners say the same. The pattern is similar when gun owners and non-owners are asked about those who have children in their home. About a third of gun owners (36%) say they generally keep all of the guns in their home in a locked place, while 63% say there is at least one gun that is not kept locked. 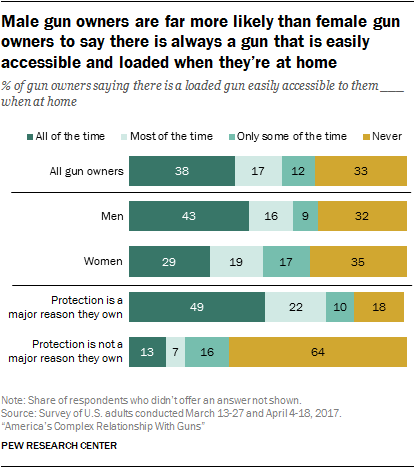 When asked whether they keep their guns loaded or unloaded, 44% of gun owners say there are no loaded guns in their home, while 55% say there is at least one gun that is kept loaded. Among gun owners who have children younger than 18 at home, 54% say all of the guns in their home are kept locked, compared with 30% of those with no children living in their home. And while 53% of gun owners with children at home say none of the guns in the home are kept loaded, 40% of those with no children say the same. Seven-in-ten gun owners say they have taken a gun safety course such as weapons training, hunter safety or firearm safety. While this is particularly the case among those who consider it essential for gun owners to take such courses – 83% of gun owners with no children in the house who say it is essential also say they have done this – about half of those who don’t consider this essential (55%) also say they have taken a gun safety course. Gun owners with multiple guns are more likely than those who own only one gun to report taking a gun safety course. About three-quarters of those who own two or more guns (77%) say they have done so, compared with 55% of those who own a single gun. Majorities of gun owners across demographic groups say they have taken a gun safety course, but some differences emerge. For example, male gun owners are more likely than their female counterparts to say they have done this (76% vs. 60%). And while about three-quarters of those younger than 50 (77%) say they have taken a gun safety course, somewhat smaller shares of older gun owners (63%) say the same. 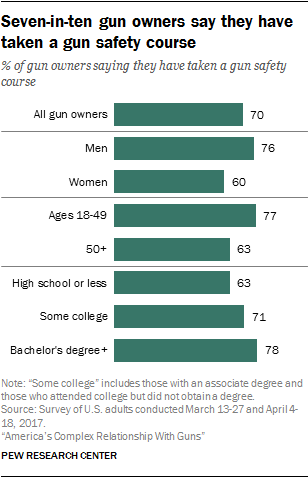 Among gun owners with at least a bachelor’s degree, 78% say they have taken a gun safety course, compared with 63% of those with a high school diploma or less education. Among those who don’t personally own a gun, similar shares of those who currently live in a gun-owning household and those who don’t say they have taken a gun safety course (22% and 19%, respectively). Legal requirements regarding gun safety courses vary widely by state. Many states require hunter education training or safety courses in order to obtain a hunting permit or permit to carry a handgun, and some states require a course or exam in order to own or purchase a gun. About six-in-ten parents (60%) say they have talked with their children under the age of 18 about gun safety. This includes 82% of gun owners and about half of non-owners (51%). Among non-owners, women are more likely than men to say they have talked with their children about this (58% vs. 37%). Those who live in the Midwest (64%) or South (59%) are more likely than those in the Northeast (31%) or West (40%) to say they have done this. There are no notable demographic differences among gun owners in the shares who say they have talked with their children about gun safety. Some four-in-ten gun owners (38%) report that there is a gun that is both loaded and easily accessible to them all of the time when they are at home, and another 17% say this is the case most of the time; 12% of gun owners say they have easy access to a loaded gun only some of the time when they’re at home, and a third say they never do. Male gun owners are far more likely than their female counterparts to say there is a gun that is both loaded and easily accessible to them all of the time when they are at home; 43% of men who own guns say this is the case, compared with 29% of women. This gender gap is particularly pronounced among gun owners younger than 50. Among this group, 41% of men and just 17% of women say they have easy access to a loaded gun all of the time when they’re at home. Among those 50 and older, similar shares of men and women say this is the case (44% and 40%, respectively). Among gun owners with a high school education or less, 45% say they have a gun that is both loaded and easily accessible all of the time when they’re at home. Somewhat smaller shares of those with some college or with a bachelor’s degree say the same (33% of each). Similarly, gun owners who say their local community is not too safe or not at all safe from crime are somewhat more likely than those who describe their community as very or somewhat safe to say they have easy access to a loaded gun all of the time when they’re at home (46% vs. 35%). Three-quarters of gun owners say they feel safer with a gun in their household than they would without a gun; about a quarter (23%) say having a gun doesn’t make them feel any more or less safe than they would if there wasn’t a gun in their household (just 2% of gun owners say a gun makes them feel less safe). Among non-owners who say someone else in their household owns a gun, similar shares say having a gun in their household makes them feel safer (50%) as say having a gun doesn’t make them feel any more or less safe (44%); 6% of non-owners who live in a gun-owning household say they feel less safe than they would without a gun in the household. Among those who do not own guns but live in a gun-owning household, 57% of those who grew up with a gun in their household say having a gun at home makes them feel safer than they would without a gun; 40% of those who didn’t grow up in a gun-owning household say the same. 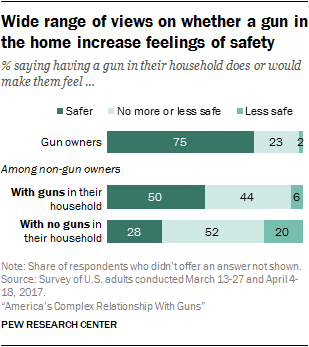 Meanwhile, about half of non-owners who don’t live in a gun-owning household (52%) say having a gun wouldn’t make them feel safer or less safe, with slightly more saying they would feel safer (28%) than saying they would feel less safe (20%) if there was a gun in their household. Among this group, about half of those who say they could see themselves owning a gun (47%) say having a gun in the household would make them feel safer than they do without a gun; just 9% of those who say they could never own a gun say a gun would make them feel safer. About a third of those who can’t see themselves ever owning a gun (32%) say they would feel less safe with a gun in their home, while 59% say they would feel no more or less safe.